James Madison is remembered primarily as a systematic political theorist, but this bookish and unassuming man was also a practical politician who strove for balance in an age of revolution. 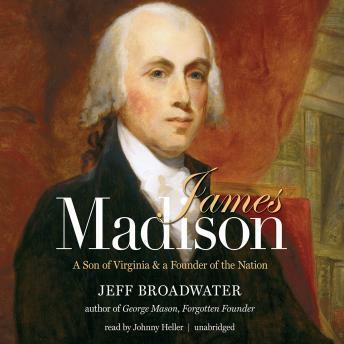 In this biography, Jeff Broadwater focuses on Madison's role in the battle for religious freedom in Virginia, his contributions to the adoption of the Constitution and the Bill of Rights, his place in the evolution of the party system, his relationship with Dolley Madison, his performance as a wartime commander-in-chief, and his views on slavery. From Broadwater's perspective, no single figure can tell us more about the origins of the American republic than our fourth president. In these pages, Madison emerges as a remarkably resilient politician and an unlikely wartime leader who survived repeated setbacks in the War of 1812 with his popularity intact. Yet Broadwater shows that, despite his keen intelligence, the more Madison thought about one issue-race-the more muddled his thinking became, and his conviction that white prejudices were intractable prevented him from fully grappling with the dilemma of American slavery.